The project of the Sherlock Holmes stories is to dispel magic and mystery, to make everything explicit, accountable, subject to scientific analysis. . . . Holmes and Watson are both men of science. Holmes . . . is a scientific conjuror who insists on disclosing how the trick is done. The stories begin in enigma, mystery, the impossible, and conclude with an explanation which makes it clear that logical deduction and scientific method render all mysteries accountable to reason. . . . The stories are a plea for science not only conventionally associated with detection (footprints, trace of hair or cloth, cigarette ends), where they have been deservedly influential on forensic practice, but in all areas. They reflect the widespread optimism characteristic of their period concerning the comprehensive power of positivist science (Italics added). Contrary to this orthodoxy, the actual role of science in the stories is as thin as the Great Detective. All the real science actually used by Holmes could be recorded on one of the index cards in Holmes’s criminal archives. While I can’t in a short article survey the entire canon to controvert this orthodoxy, what I will attempt to do is persuade you to return to the stories themselves and ask just how much science Holmes actually uses. If you do, I am confident that you will be inclined to question whether the widely accepted view of Holmes as the avatar of science, logic, and reason can stand up to a careful reading of the stories themselves. 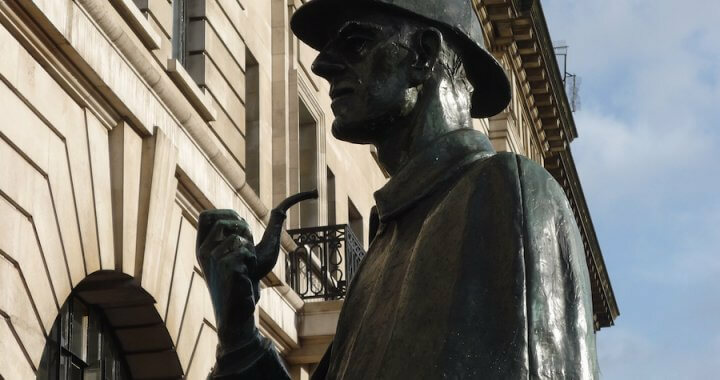 It is not just literary scholars, Sherlockians, and the legions of Holmes fans around the world who have perpetuated the myth of Holmes the scientific detective. Scientists, or those who claim to be scientists, such as criminologists, have also been eager to elevate a fictional character to the status of an avatar of the scientist and indeed of science itself as the highest form of knowledge human beings have achieved. As an example, I would point to the article entitled “Sherlock Holmes: Father of Scientific Crime Detection,” published in The Journal of Criminal Law, Criminology, and Police Science and written by Stanton Berg, a criminologist who is a fellow of the American Academy of Forensic Science and a member of the International Association of Identification, originally the International Association for Criminal Identification, which is the largest forensic organization in the world. “I feel,” says the author, “that a strong case can be made that the famous sleuth had a decided stimulating influence on the development of modern scientific crime detection.” In a section of the article entitled “Evidence in the Stories,” Berg cites the scene in the first Holmes story, A Study in Scarlet, in which Holmes is introduced to Watson—and to the reader. At this meeting, Holmes enthusiastically announces that he has, in his words, “found a re-agent which is precipitated by haemoglobin, and by nothing else. . . . Why, man, it is the most practical medico-legal discovery for years. Don’t you see that it gives us an infallible test for blood stains. . . . Had this test been invented, there are hundreds of men now walking the earth who would long ago have paid the penalty of their crimes.” Although at the time considerable research was being done in the field of blood serology, Conan Doyle as a doctor would certainly have been aware that a reliable test for blood was not available when he wrote the story. Thus Holmes’s discovery was, in 1887, science fiction. It was not until the end of the century that a 100 percent-reliable test for bloodstains was discovered, spectroscopic analysis, and eventually became available to crime-scene investigators. It was only in 1901, that a German researcher developed a reliable method of distinguishing between animal and human blood. The only details at the crime scene that are relevant to Holmes’s investigation are the tracks of the four-wheeled cab in the street outside the building where the murder took place, but this detail does not identify the criminal. Rather it leads Holmes to suspect that the murderer and his victim likely arrived together in a hansom cab. Holmes learns the identity, including the name, of the murderer not from his analysis of the crime scene, but rather from the Cleveland police, who later inform him that the murder victim was being stalked in America by a man named Jefferson Hope, and so Holmes reasonably concludes that Hope has pursued the victim to London and had likely been stalking him there. To arrive at this conclusion, Holmes does not rely on the methods of science; rather he speculates that the murderer would probably use a carriage to carry out his surveillance before the murder took place and that working as a cabman would be the most likely way for Hope to get access to a hansom cab. Assuming his guess to be correct, Holmes recruits the Baker Street Irregulars to canvass all the cab companies in London to find out if they have anyone named Jefferson Hope working as a cabbie. And thus Hope is easily tracked down and identified since he has not changed his name. To do all this requires no expertise in science, and forensic science, in the sense of testing bloodstains at the crime scene or identifying tobacco ash and linking it to someone who smokes that brand, plays no role whatsoever in Holmes’s success in capturing Hope (or any other criminal). So what are all the references to science doing in this story and in dozens of others? Their purpose, beginning with Holmes’s scientific “discovery” in the first story, is, I suggest, to confer on him the aura of science; in his actual investigation of the two murders in A Study in Scarlet, science plays an insignificant role, just as it does the rest of the stories. I would even go so far as to say that the role of science in the stories is trivial. The science in them has little to do with providing Holmes with an infallible method for detecting crimes. Rather the multiple references to science are part of Conan Doyle’s method as a fiction writer for creating the Holmes persona. 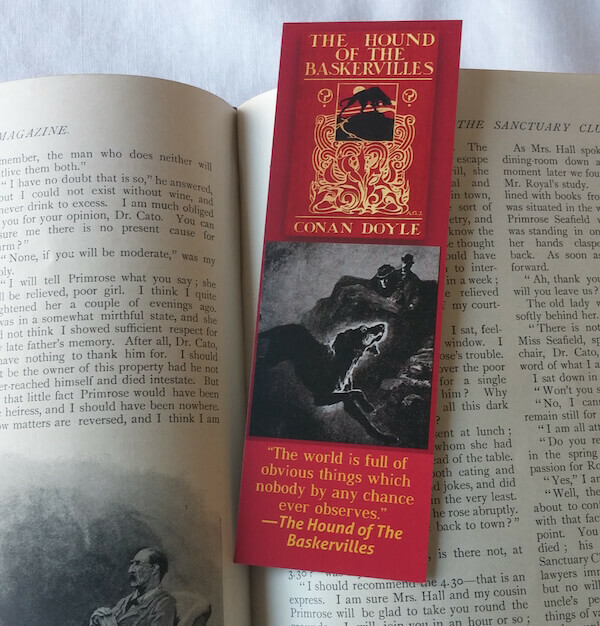 Conan Doyle’s characterization of Holmes includes his dress (the deerstalker cap and the Inverness cape), his violin playing, and the frequent attendance at musical concerts and trips to art galleries, such as the visit to an exhibition of modern Belgian paintings in The Hound of the Baskervilles. As we have seen, in A Study in Scarlet Holmes is introduced to us in a laboratory exulting over a chemical discovery. Conan Doyle’s coding Holmes as a man of science relies on the fact that most readers will transfer this character trait—an interest in experimental science—to the methods Holmes actually uses to solve mysteries, especially if Holmes himself talks a lot about his self-described “science of deduction and analysis” (the title of two chapters in the first two stories) and if he is repeatedly associated with conventional images of the experimental scientist, such as carrying out chemical experiments in the flat at 221B Baker Street, then readers will accept the idea that Holmes uses science to solve crimes. These experiments, however, have absolutely nothing to do with the case being investigated in that particular story. Consider, for example, “The Naval Treaty,” which is about the theft of a secret treaty between England and Italy. In it we are introduced to Holmes seated at his side table clad in his dressing gown and working hard over a chemical investigation. A large curved retort was boiling furiously in the bluish flame of a Bunsen burner, and the distilled drops were condensing into a two-litre measure. . . . He dipped into this bottle or that, drawing out a few drops of each with his glass pipette, and finally brought a test tube containing a solution over to the table. In his right hand he had a slip of litmus paper. Holmes excitedly says to Watson, “You have come at a crisis . . . If this [litmus] paper remains blue, all is well. If it turns red, it means a man’s life.” He dipped it into the test tube and it flushed at once into a dull, dirty crimson. All this is part of a stage set brilliantly created by Conan Doyle. The experiment, however, has absolutely nothing to do with the case of the stolen naval treaty. Neither chemistry, nor any aspect of science, will contribute to recovering the purloined treaty, any more than it does in Dupin’s retrieval of the purloined letter in Poe’s story of that name. In “The Copper Beeches,” after the client, Violet Hunter, leaves, Holmes turns to “one of those all night chemical researches” that Watson frequently witnesses. This vignette of Holmes as the assiduous and inquisitive experimental chemist is Conan Doyle’s way of creating for his readers the illusion that science is of paramount importance in solving Holmes’s cases. “The Dancing Men” similarly opens with a description of Holmes hunched “over a chemical vessel in which he was brewing a particularly malodorous product.” However, experimental science plays no role in that story either. The BBC News World Edition reported (16 October 2002) that The Royal Society of Chemistry was conferring on Holmes a posthumous honorary fellowship. For what? It’s like the Nantucket Historical Whaling Society posthumously awarding Captain Ahab an honorary membership. Nevertheless, readers have unquestioningly assumed that the interest Holmes frequently shows in science and in chemistry is somehow evidence of the application of science to the cases he investigates. However, I would not go as far as detective story writer Julian Symons, who in his history of crime fiction, Bloody Murder, claims that “Holmes is a deerstalker, a magnifying glass and a capacity for reasoning, not a human being.” Nevertheless, Symons is certainly right in seeing the “capacity for reasoning” as one of the numerous traits, on a par with the deerstalker cap, that constitutes Holmes as a character, rather than as evidence of his application in the stories of a scientific methodology that exists outside the stories and that Holmes triumphantly puts into practice. It may appear that in questioning the role of science and logical reasoning in the Holmes stories I am calling attention to a fault in them. Nothing could be further from the truth. The strength of the Holmes stories, in my view, is not Holmes’s solution to puzzles, but Conan Doyle’s exposure of the limitations of Holmes’s science of deduction and analysis. The stories are not a celebration of power of science and logic, and certainly not a contribution to the new science of criminology, but a critique of the Victorians’ exaggerated faith in the power of science. This aspect of the stories, the foundation of their artistic success, has been overlooked by Conan Doyle scholars and by Sherlock Holmes fans for whom the Great Detective is an object of admiration, if not idolatry. My explanation for this astonishing misreading is that critics and fans alike have come to the stories with the prior assumption that they are pure ratiocinative detective stories and that a defining characteristic of that form is its primary focus on a detective who solves mysteries with logic, reason, and science. It rarely occurs to them to adopt a critical attitude to the detective—his very faults are endearing. However, if we can free ourselves from our prior assumptions about what we have come to expect to find in the Holmes stories, we may be able to view them in a new light and perhaps even agree with Conan Doyle that while Holmes’s science of detection and analysis can answer many questions, there remain many that it cannot answer. And it is those questions that Conan Doyle the artist leaves his readers to ponder. Nils Clausson is Professor Emeritus at the University of Regina (Saskatchewan, Canada). Before retiring he taught a course on the history of detective fiction and recently revived the course for the Lifelong Learning Centre at the University of Regina. He has published articles on Conan Doyle in both scholarly journals, such as Journal of Popular Culture and Narrative Theory, and in Holmes magazines such as Canadian Holmes and The Sherlock Holmes Journal. In 2008 he convened an international Conan Doyle symposium at the University of Regina and recently published Arthur Conan Doyle’s Art of Fiction: A Revaluation (Cambridge Scholars Publishing 2018).